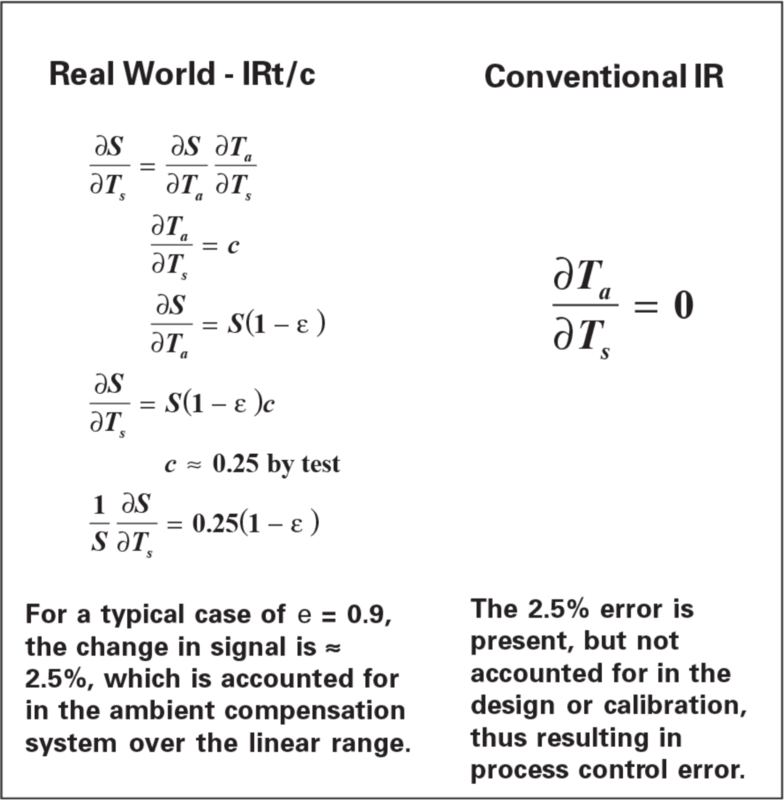 The table below summarizes some of the major differences between how IRt/c’s are designed and calibrated, compared to conventional infrared devices, with the objective of providing the best possible accuracy under actual real-world conditions. The concept of a black-body is a highly useful and essential mathematical construction in the application of infrared radiation physics, and has had firm theoretical support from the time of Max Planck nearly 100 years ago. However, in the real world application of infrared methods for temperature control, IR devices do not measure black-bodies. 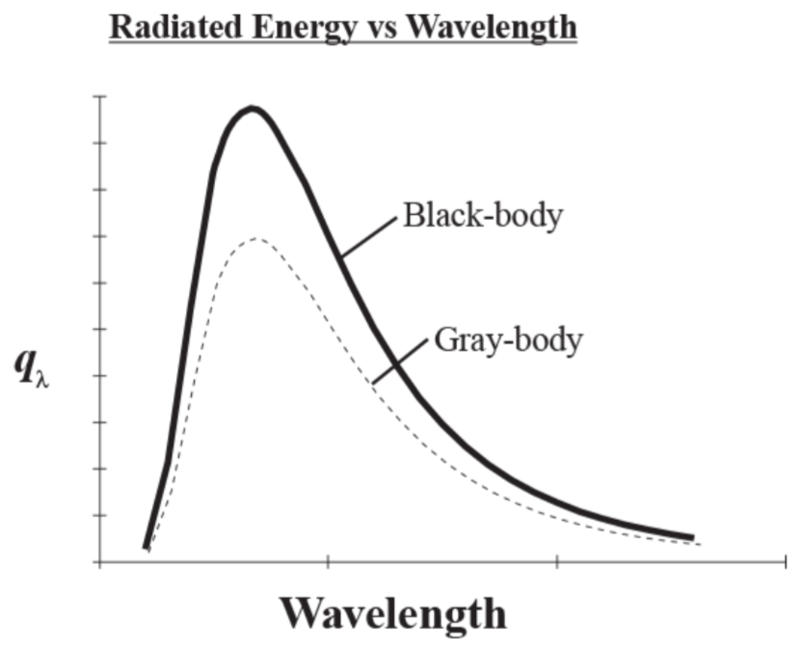 at all wavelengths, where qgb and qbb are radiated energy from a gray-body and black-body respectively. Accordingly, for a black-body = 1, and therefore = 0. But for a gray-body < 1 and therefore > 0, and the reflected radiation due to ambient temperature must be considered. Refer to Tech Note No. 64 for further details. IRt/c’s are specifically designed to be accurate and reproducible under real world conditions of targets that approximate gray-bodies, with ambient temperatures that vary, thus with reflected radiation that varies. The performance specifications of the IRt/c, unlike conventional infrared devices, include graybody effects. Mathematically the signal output of an IRt/c is a complex function of target temperature, ambient temperature, target emissivity, reflected energy, thermocouple type, etc. To clarify the specifications we can represent the change in signal with respect to a variable of interest, while holding all other variables constant, as a partial derivative. where S is the output signal and Ta is the ambient temperature. This equation describes the output of the IRt/c, including a gray-body assumption of emissivity = 0.9, and that the sensor itself is at the same temperature as the environment. What this means in practice is that when an IRt/c is installed and calibrated in place (Tech Notes #1, #64), the IRt/c body tends to change temperature with the ambient background that the target sees, then internally applies the correction required to reduce errors. Without this feature this error could be many times higher, and cause unwanted shifts in process control temperature. 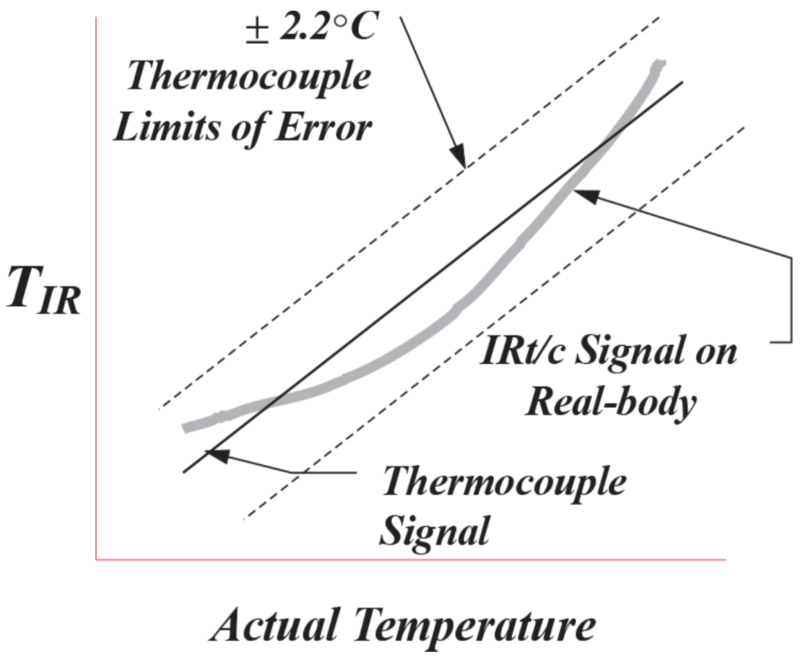 A common assumption for conventional IR thermometry is that emissivity is constant with changes in target surface temperature. Real materials do not have this characteristic. The average value for nonmetals for which the change in emissivity with respect to surface temperature has been reported, is approximately - 2% per 100°F target temperature change (- 3% per 100°C). 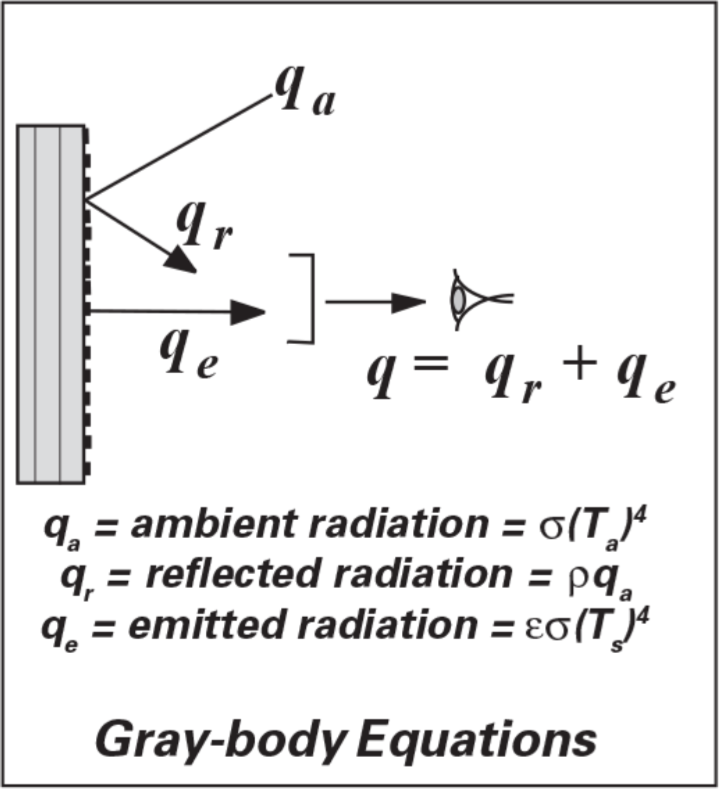 Note: Thermal Radiative Transfer and Properties, MQ Brewster ed., John Wiley & Sons, 1992. Conventional IR misses this effect, and will cause process control errors. 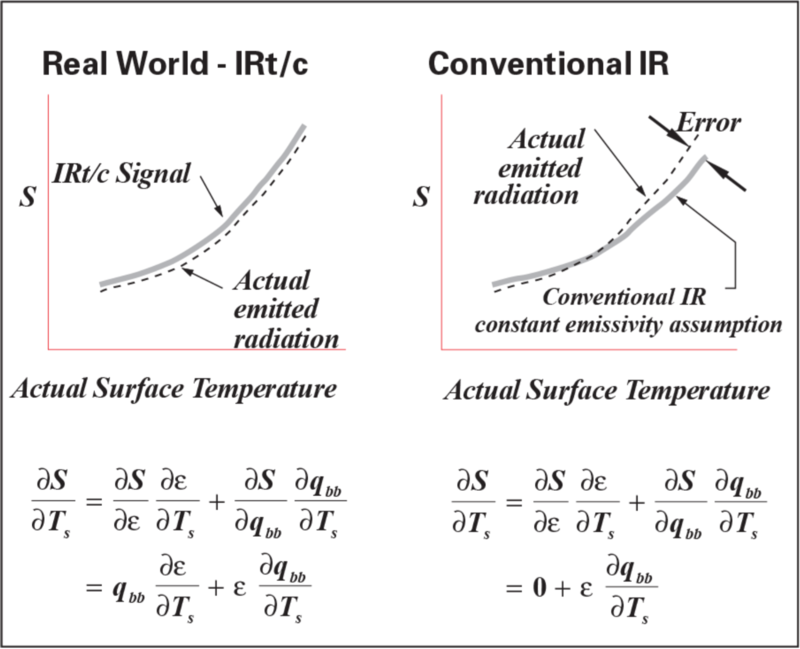 Note that the conventional IR device loses one term of the signal change with respect to surface temperature. When the IR signal is converted to a temperature indication, the signal in the conventional device is linearized, whereas in the IRt/c the signal is unchanged. 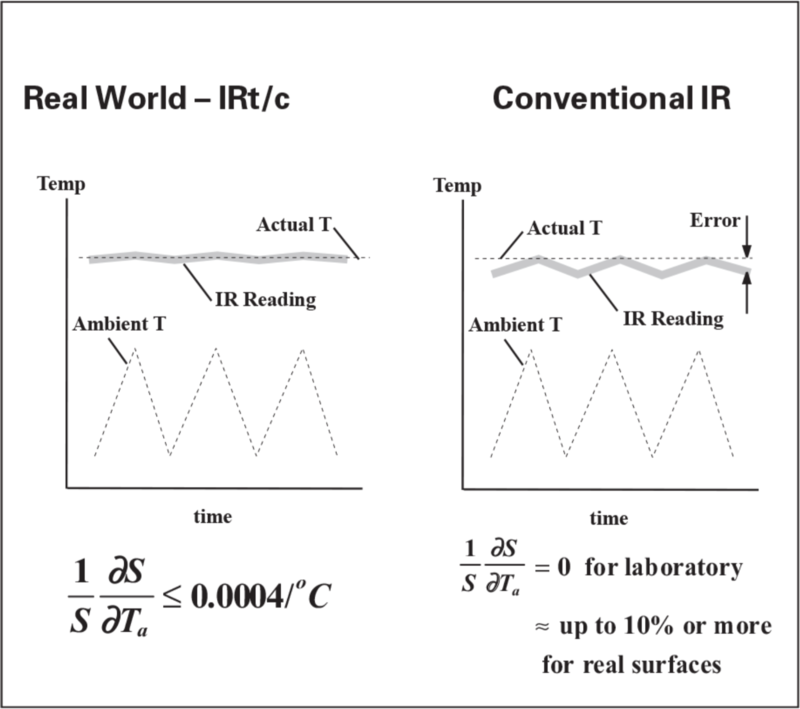 Since real-world emissivity for most non-metal materials decreases with temperature, the constant emissivity assumption of conventional IR devices produces errors in readings that are not obvious to the typical IR user and can be highly misleading over a wide temperature range. The IRt/c, however, is specified for a useable specific temperature range, where the effect of emissivity change is accounted for in the linearity specification, and the user is confident that his process control will be accurate. Note that testing an IRt/c with a black body will not give the same linear range as a realbody. A second effect on linear range is the effect of target surface temperature on ambient temperature, and therefore the reflected component of radiation to the sensor. As target temperature increases within a process, the increased radiation heat transfer to the surroundings will cause the target ambient radiant background to also increase in temperature. For example, a laminating process that has several temperature control settings that depend on the material and feed speeds, may operate with target temperatures that are 100°F (56°C) different. As the material changes temperature, the background radiation in the vicinity of the measurement will also change temperature, and influence the IR reading. Standard thermocouples are generally specified as adhering to ASTM and ANSI specifications, hichprescribe a basic accuracy of ±2.2°C, or 0.75% of reading, whichever is higher2 . 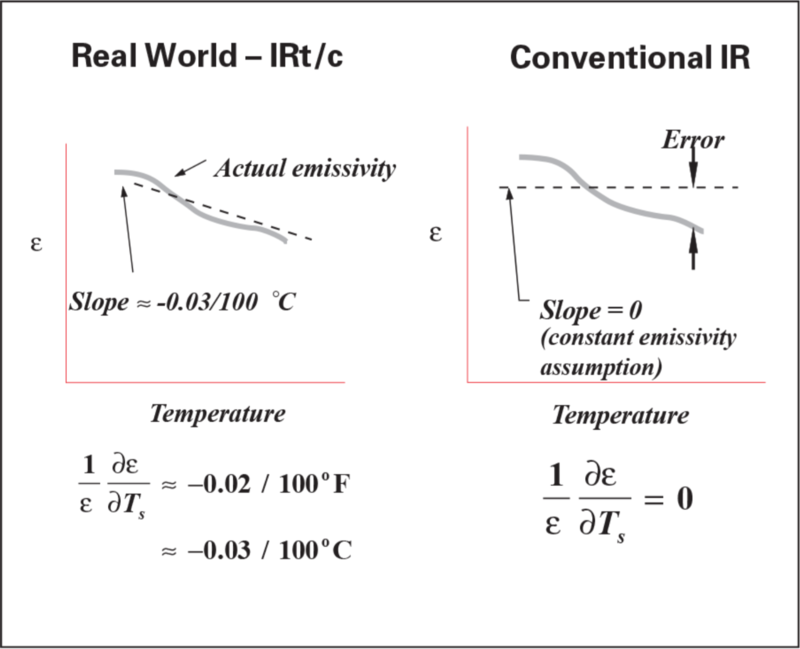 Likewise, IRt/c’s are also specified to be within the same ±2.2°C limits, or to the percentages stated in their specifications, whichever is higher. However, it is important to note that when an IRt/c is calibrated to installation, this error disappears. The cardinal requirement for the IRt/c, as in any measuring device, is to repeat its calibration. The repeatability of IRt/c’s is specified at <0.1°C. Interchangeability uncertainty from one device to another is 2% maximum, since each individual device is built and tested to conform to standards with a ±1% tolerance, so is therefore able to produce a maximum of ±2% difference between any two devices. Typical interchangeability uncertainty, determined by test, is described statistically with standard deviation of approximately 0.5°C. 1. 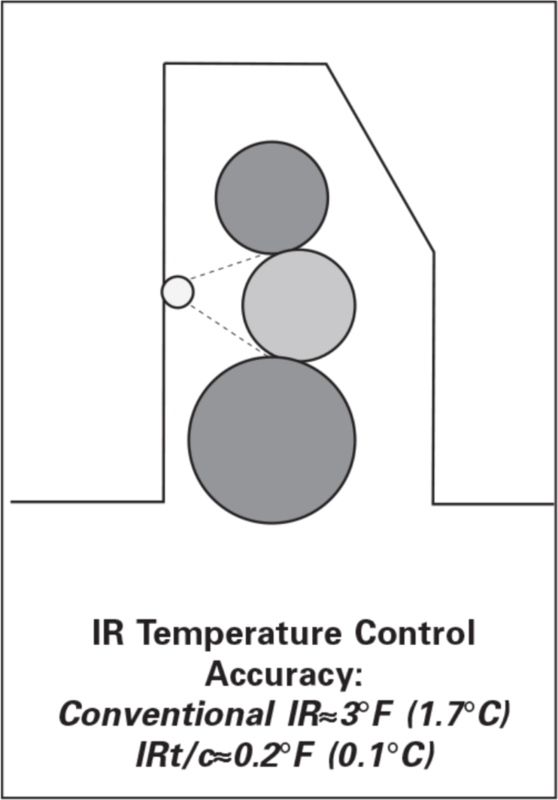 The IRt/c is a different type of device compared to conventional IR, since it is carefully designed and built to produce real world accuracy for temperature control, with some subtle features that make a significant improvement over conventional IR. 2. In-place calibration is always recommended, as it always is with any IR device due to uncertainties in emissivities and ambient temperature. 3. For OEM applications, or multiple same-use applications in a factory, once the initial system has been qualified and calibrated, IRt/c’s of the same model can be substituted without the necessity of recalibration. 4. An added benefit of the IRt/c is its specified useable linear range per model. 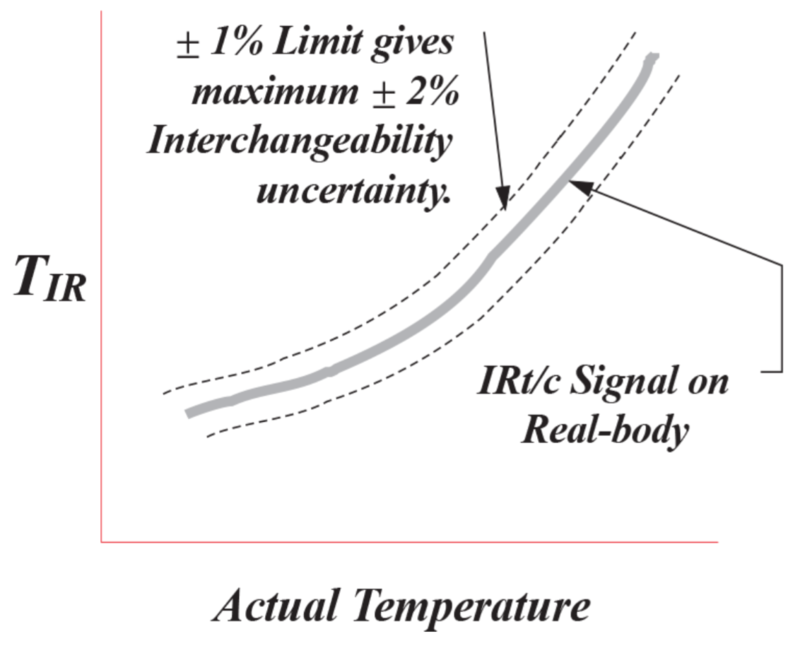 (A user is not led into believing that his measurement is accurate over a wide temperature range, a common misunderstanding with conventional IR. Thermal physics and scientific data demonstrate that trying to track real-world surface temperatures over a range greater than approximately 100°F (56°C) involves accounting for increasing errors that cannot be handled by conventional IR devices. This includes not only permanently mounted IR sensors, but portable handheld IR devices, also.) There is one exception to this rule, however, the Microscanner D-Series portable IR scanners. (See Tech Note #33, #91) They have the largest useable target temperature ranges with the least amount of possible errors due to emissivity and ambient reflections. Use of the Microscanner D and DX Series is recommended for calibrating and checking IRt/c sensors in temperature ranges less than 1600°F (850°C). 5. An IRt/c’s full performance cannot be accurately checked with a black-body. Standard laboratory black-bodies can be used for pass-fail or reproducibility testing only. Contact Exergen for availability of specialized test devices. 6. An IRt/c’s full performance cannot be accurately checked with a conventional handheld portable IR device, there are too many external sources of error. See Tech Note #91.